This was a little test of mine to bring together a mixture of flavours that would hopefully make my mouth water - and that it did! I'm all about adding powerful spices for that extra oomph of flavour and this recipe didn't disappoint. For this I used chicken thigh because it gives extra flavour and the meat is so tender, however for a leaner option this is perfect for chicken breast too, just reduce the cooking time so it isn't dry. First, you’re going to mix the ingredients of your sauce. Take a small bowl, and add both soy sauce and the honey and mix until combined. Next, add in your ground coriander, ground cinnamon, ginger and garlic and give it a good mix. Set aside until you’re ready. Now place a wok and onto a medium heat with a splash of rapeseed oil. If you don’t have a wok, a good sized frying pan will do. Medium heat is good for chicken thighs because they take slightly longer to cook, and when you add your sauce later it won’t fry off. When hot, add in your shallot and stir fry for a couple of minutes until soft and just starting to brown. Next add your diced chicken and stir around quickly, sealing the meat off but not cooking through. Reduce the heat to low, wait a few moments and pour in your sauce mixture. You don’t want to fry too much of the sauce off, as you’ll finish cooking your chicken in it so it will slowly simmer off anyway. Once your sauce is added, drop in a star anise. Turn the heat back up and bring to a boil, then reduce back down and simmer gently, stirring occasionally. Simmer for around 10-15 minutes, or until your chicken is cooked thoroughly. You can check by cutting into the largest piece to check for any pink bits. Lastly, add your cornflour to 1 tbsp of water and stir to create a white mixture. Add this to your sauce and stir slowly, simmering until you get a thicker consistency. 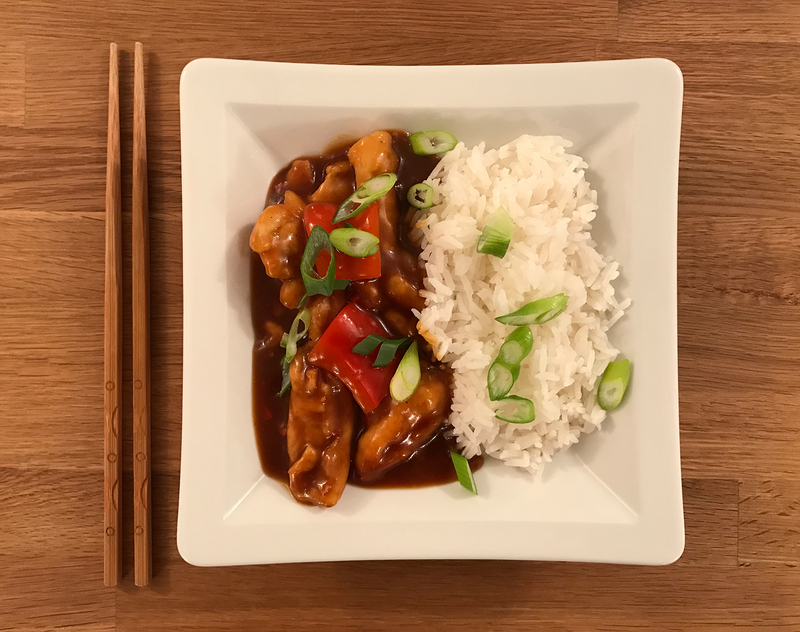 Once you’re happy the chicken is cooked and your sauce is thick enough, serve up with some steamed jasmine rice, sprinkle with spring onion and serve. You could also sprinkle some red chilli if you’re looking for a bit of a kick. Give this one a go and let me know what you think! I’m always experimenting with asian flavours so open to suggestions!